With this new year, we are excited to share our new newsletter with you! Covering topics that include energy storage, renewable energy integration, transmission planning and operations, defense energy, cybersecurity and more, Sandia’s Grid Modernization Program Newsletter features research highlights, upcoming events, technical recognition, and new publications and patents. This quarterly newsletter is also available on Sandia’s Energy and Climate website. We hope you enjoy! Sandia researchers are currently studying how ultrawide bandgap semiconductor materials could be used to create more compact and efficient power electronics, leading to higher absolute voltages for distributing power grid energy. These materials, such as AIGaN, allow devices to operate at higher voltages, frequencies, and temperatures than wide bandgap materials, such as silicon carbide (SiC) and GaN. When made into transistors, the materials have the potential to vastly improve the performance and efficiency of not only electrical power grids, but also electric vehicles, computer power supplies, and motors for such things as heating, ventilation, and air conditioning (HVAC) systems. To learn more, see the complete news release. Sandia's Energy Storage Projects team within the Stationary Energy Storage Program is working with the government of Singapore’s Energy Market Authority (EMA) to help set up Singapore’s first grid energy storage test-bed. This will lead to the selection and development of three energy storage test-beds at existing electrical substations. Sandia will help develop standards and guidelines for grid integration and fire safety, assess the economic case for energy storage systems, offer guidance on the policy and regulatory frameworks, and provide periodic reports to EMA on the performance of the test systems. Sandia is working with EMA under a four-year Cooperative Research and Development Agreement sponsored by the U.S. Department of Energy’s (DOE) Office of Electricity’s Stationary Energy Storage Program managed by Dr. Imre Gyuk. See the complete news release. With support from Sandia, NEC Energy Solutions has begun the installation and commissioning of a 2-MW, 3.9-MWh GSS® grid energy storage solution for the Sterling Municipal Light Department in Sterling, Massachusetts. Once complete, it will be the largest system of its kind installed in New England and the first utility scale project in the state. In the event of an extended grid outage due to a natural disaster, this utility scale Battery Energy Storage System can be used to power local emergency response facilities using power generated from two nearby solar plants. The system will also provide enhanced clean energy usage and cost savings to the town. Read the full story. To simulate and understand interactions of solar PV variability and the benefits of smart grid controls, researchers at Sandia, National Renewable Energy Laboratory, Georgia Tech, EPRI, and CYME have developed eight new, rapid quasi-static time series (QSTS) analysis methods that are 10 times faster than before. These innovative methods are advancing the state-of-the-art in time series analysis of electric power systems by significantly reducing computational time. This project is part of the Grid Modernization Laboratory Consortium portfolio of projects funded by the Energy Department’s SunShot Initiative in support of the Grid Modernization Initiative. In the first year, researchers exceeded the target goal of creating five new methods showing a 50% reduction in computation time by developing three additional methods that showed more than a 90% reduction. Sandia, Bonneville Power Administration, and Montana Tech have collaboratively developed and successfully tested a control system for stabilizing power grid oscillations using real-time phasor measurement unit (PMU) feedback located hundreds of miles away from the controller. The controller modulated the Pacific DC Intertie and resulted in improved oscillation damping while causing no harm to the grid. The team was the first in the nation to successfully conduct this type of testing, which resulted in a safe, effective, and economical strategy to prevent widespread outages, enable higher penetration of renewable energy, and increase transfer capacity. During the 2016 Defense Energy Summit, Alan Nanco, Manager of Military and Energy Systems Analysis, highlighted Sandia’s capabilities, facilities, expertise and ongoing projects during the “Energy-System Testing and Evaluation to Support DoD Applications” Panel Session. Included in the panel were representatives from National Renewable Energy Laboratory, Pacific Northwest National Laboratory, and Idaho National Laboratory. The panel discussed research, development, testing and evaluation capabilities, and platforms at the Department of Energy National Laboratories that support performance testing and risk reduction for pre-commercial energy technologies and systems prior to deployment to DOD and other end-users. Alan also served as a Defense Energy Technology Challenge Reviewer for the Defense Innovation Challenge track at the Summit, which is designed to accelerate private-sector and defense-sourced technology solutions aligned with warfighter and national security problem-sets. As part of Energy Action Month, Sandia led a webinar on microgrids and energy assurance that is now available for download. The webinar was presented in cooperation with the U.S. Department of Defense (DoD) Office of the Assistant Secretary of Defense for Operational Energy and the DOE Office of Electricity Delivery and Energy Reliability, and it contains material from Sandia’s training course, "Fundamentals of Advanced Microgrid Evaluation, Analysis, and Conceptual Design." Topics include emerging design and operations drivers, threats, security, and resiliency needs. There is also a discussion of the changing metrics seen in the DOE, DoD, and U.S. Department of Homeland Security strategic plans, energy improvement options, and the use of microgrids at military installations, contingency bases, and expeditionary operations. A follow-on Microgrid Design Workshop will be held March 13-14 in Washington D.C. Registration is open for Meeting the Challenge: 2017 Energy Storage Systems (ESS) Safety Forum to be held at the historic La Fonda Hotel in Santa Fe, New Mexico. The two-day, MRS-endorsed ESS Safety Forum on February 22-23 will provide a platform for discussing the current state of ESS safety and mitigation strategies around improving cell to system level safety and reliability. Following the Forum will be a half-day meeting of the ESS working groups the morning of February 24. Sandia’s Precision High-Power Battery Tester, co-developed with Arbin Instruments, Ford Motor Co., and Montana Tech, received the 2016 Green Tech Special Recognition Award presented by R&D Magazine. The tester significantly improves battery life predictions, helping meet the growing demand for better, longer-life electrified vehicle and grid storage batteries. View the video submission and see the complete list of Sandia’s Energy and Climate 2016 R&D awards. Ray Byrne, Distinguished Member of the Technical Staff, has been named an IEEE Fellow for his contributions to miniature robotics and grid integration of energy storage. The IEEE Grade of Fellow is conferred by the IEEE Board of Directors upon a person with an outstanding record of accomplishments in any of the IEEE fields of interest. The total number selected in any one year cannot exceed one-tenth of one-percent of the total voting membership. IEEE Fellow is the highest grade of membership and is recognized by the technical community as a prestigious honor and an important career achievement. S. Wing, J. Johnson, E. Camporeale, G. Reeves, Information theoretical approach to discovering solar wind drivers of the outer radiation belt, 1 Oct 2016, Journal of Geophysical Research-Space Physics. 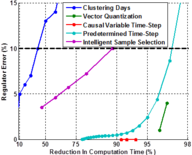 C. Safta, R. Chen, H. Najm, A. Pinar, J. P. Watson, Efficient Uncertainty Quantification in Stochastic Economic Dispatch, 6 Oct 2016, IEEE Transactions on Power Systems (Volume: PP, Issue: 99). J. Johnson, J. Neely, J. Delhotal, M. Lave, Photovoltaic Frequency-Watt Curve Design for Frequency Regulation and Fast Contingency Reserves, 1 Nov. 2016, IEEE Journal of Photovoltaics. M. Lave, J. Stein, R. Smith, Solar Variability Datalogger, 1 Nov 2016, Journal of Solar Energy Engineering - Transactions of the ASME. H. Barkholtz, D. Liu, Advancements in Rationally Designed PGM-free Fuel Cell Catalysts Derived from Metal-Organic Frameworks, 14 Nov 2016, Materials Horizons. J. Barnett, J. P. Watson, D. Woodruff, BBPH: Using progressive hedging within branch and bound to solve multi-stage stochastic mixed integer programs, 27 Nov 2016, Oelsevier Operations Research Letters, Volume 45, Issue 1. R. Go, F. Munoz, J. P. Watson, Assessing the economic value of co-optimized grid-scale energy storage investments in supporting high renewable portfolio standards, 1 Dec 2016, Elsevier Applied Energy Volume 183. K. Meyer, R. Cheaito, E. Paisley, C. Shelton, J. Braun, J.P. Maria, J. Ihlefeld, P. Hopkins, Crystalline coherence length effects on the thermal conductivity of MgO thin films, 1 Dec 2016, Journal of Materials Science. Sandia's Grid Modernization Program is supported by the U.S. Department of Energy's Grid Modernization Initiative (GMI). GMI represents an Energy Department wide and partner collaboration, which accelerates the development of technology, modeling analysis, tools, and frameworks to help enable grid modernization adoption.